The Punisher is a fictional Character, an antihero that appears in comic books published by Marvel Comics. The character was created by writer Gerry Conway and artists John Romita, Sr., and Ross Andru, with publisher Stan Lee providing the name. The Punisher made his first appearance in The Amazing Spider-Man (cover-dated Feb. 1974). The Punisher is a vigilante who employs murder, kidnapping, extortion, coercion, threats of violence, and torture in his war on crime. Driven by the deaths of his wife and two children, who were killed by the mob during a shootout in New York City's Central Park, the Punisher wages a one-man war on the mob and all criminals in general by using all manner of conventional war weaponry. His family's killers were the first to be slain. 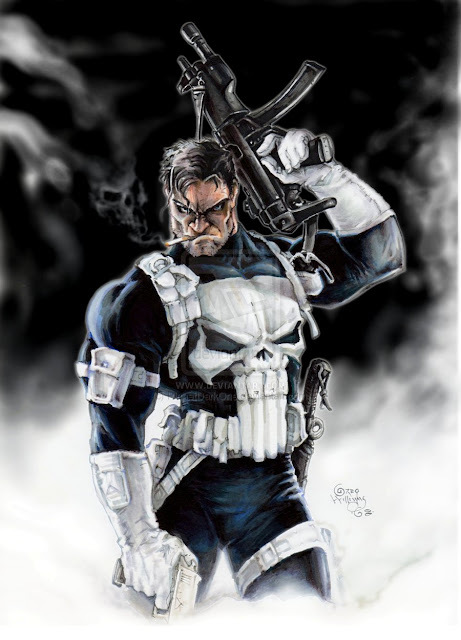 A war veteran of the U.S. military, Frank Castle is a master of martial arts, stealth tactics, guerrilla warfare, and a wide variety of weapons.
" Heidegger, who took Kierkegaard's philosophy further, comes even closer to describing the Punisher: 'Since we can never hope to understand why we're here, if there's even anything to understand, the individual should choose a goal and pursue it wholeheartedly, despite the certainty of death and the meaninglessness of action.' That's sure the Punisher as I conceived him: a man who knows he's going to die and who knows in the big picture his actions will count for nothing, but who pursues his course because this is what he has chosen to do.."
The Punisher is the recipient of multi-disciplinary military training from the United States Marine Corps. While a Marine, he also received training from the U.S. Army and U.S. Navy as well as cross-training with the Australian Special Air Service Regiment during the Vietnam War. In addition, since beginning his work as the Punisher, Castle has used his military discipline and training techniques to update and expand his skills in areas that aid in his mission (disguise, acting, use of non-military weapons, etc.). 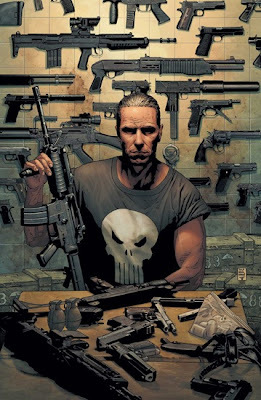 From this training, Punisher is proficient in not only basic infantry skills, but in special operations, which includes the use and maintenance of specialized firearms and explosive ordnance. He is highly trained in infiltration into heavily-guarded enemy territories and structures for the purpose of assassination, capture, and military intelligence. Also, he is trained in various forms of camouflage and stealth. He is also highly adept at hand-to-hand combat, and has been trained in multiple forms of martial arts. Both Nick Fury and Tony Stark have commented on how extraordinarily high his pain tolerance is. He does not take even over-the-counter painkillers, as he feels that their benefit of dulling pain is not worth the side effects of drowsiness and slowed reflexes. He maintains multiple safehouses and vehicles around the greater New York City area as well as multiple forged identities and bank accounts (most of the funds and equipment aiding him in his work being taken from the criminals he hunts). The Punisher has a Kevlar uniform which protects him from most gunfire, though he can still suffer concussive injury or penetration from sufficient or repeated impacts. The bright white skull in his chest is used both to intimidate his enemies and to lure their fire to the more heavily protected area of his armor. The design was supposedly taken from a Vietcong sniper he fought against during the Vietnam War. 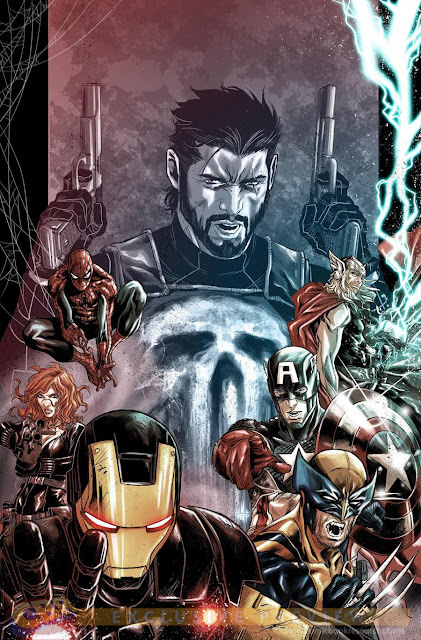 The Punisher has been using technology derived from super-villains and other costumed characters, such as the Green Goblin's pumpkin bombs, a modified Goblin Glider, and a Doctor Octopus tentacle that he can shrink down for easy storage via Pym Particles. 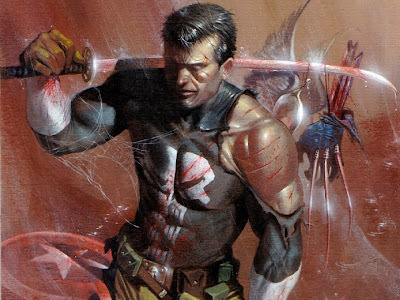 Aside from his physical prowess, the Punisher also has complete control of his mind and conscience, where psychic and telepathic powers are rendered useless against him. When Letha and Lascivious tried to control Punisher's mind, Punisher bluffs at their attempt saying "[it] doesn't feel different from any other day".